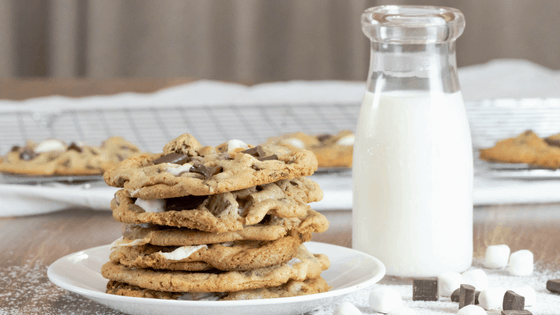 These Chocolate Chunk Marshmallow Cookies are ooey, gooey, and delicious. Add some extra texture and flavor to the traditional chocolate chip cookie by using chunks and marshmallows! I really enjoy making homemade cookies and I especially enjoyed making these. It was a lot of fun sprucing up the Plain Jane chocolate chip cookie! Adding marshmallows made the cookies really gooey and the kids loved them! Watching the marshmallows bubble and ooze in the oven had my mouth watering long before they were ready to come out of the oven. I like mega big cookies. Ridiculously big cookies. Cookies so big that it takes two hands to hold them. If that’s not your kind of cookie, you can easily drop by rounded tablespoons instead of by a cookie scoop. Of course, you’ll have to adjust the baking time accordingly… either way you make them, they’ll be delicious! Let these cookies cool after coming out of the oven before transferring to a wire rack. This recipe makes a really soft and chewy cookie and moving them too quick will cause them to fall apart. It’ll be tempting to dive into these cookies but they will continue to bake while they cool. Remember, good things come to those who wait… and these cookies are worth it! It hasn’t even been a day since I’ve made these cookies and my kids have asked when I’ll make them again. I call this cookie a huge success! They use simple ingredients and really quick to make. I’ll be making these beauties for class celebrations this year! Follow me on Facebook and Pinterest to stay up to date with my recipes! Check out my RECIPE page for more inspiration. Preheat oven to 350° and spray cookie sheet with non-stick spray. Beat together softened butter, brown sugar, and granulated sugar until smooth. Slowly add in flour, baking soda, baking powder, and salt. Gently blend ingredients together without over mixing. Using spoon, gently stir in chocolate chunks and mini marshmallows. Using cookie scoop, drop onto greased cookie sheet. Bake for about 11 minutes or until tops and edges of cookies are golden. Let cookies cool before moving to wire racks to cool completely. TIP: To yield more cookies, reduce the size of each cookie scoop to half. Bake for about 8 minutes or until golden. Wow, these look amazing! I’m really craving cookies now! I’ve been hoping for a day that’s not too hot so I can bake. Now I know what I’ll be baking. I love the ooey gooey! These are the best looking cookies ever! They have so much deliciousness going on! Do this look amazing or what?!! I bet these disappear so fast! Ooo I have two guys who would love these cookies. I would never have paired up marshmallow and cookies. This recipe is on my to do list! Now this is what you call a COOKIE! So gooey and soft! Yum! Pinning or later! I am totally making cookies now after seeing this. Love anything with marshmallow! Oh my! Those look soooo chewy and delicious! Oh! My! I’ll never be able to wait until these are cool enough to eat … I’ll be burning my mouth for sure! Love this combination! Omg, I’m loving that marshmallowy pull apart! So gooey and good with the chocolate as well. Yum!! We were just camping over the weekend and I was loving all the s’mores – this looks like the perfect cookie to relive our camping experience! these look so yummy. Who doesn’t love ooey, gooey goodness in their cookies? All I need now is a glass of cold milk. Oh! I need to make these chewy, gooey cookies ASAP! I hate to say it, but these Chocolate Chunk Cookies make me want to stop dieting right now they look so good. I can feel a cheat day coming soon!! These look amazing! Cant wait to try the recipe! Thank you!